From left: Al Poettcker, UBC Properties Trust President and CEO, and Doug Owram, UBC Okanagan's Deputy Vice Chancellor, accept a rebate cheque of $127,369.10 from John Walker, President of FortisBC, for energy saved by the Fipke Centre for Innovative Research at UBC Okanagan. A UBC Okanagan building that earned an unprecedented five Green Globes for sustainable design has now earned a FortisBC PowerSense Partners in Efficiency rebate that recognizes the building's energy efficiency. 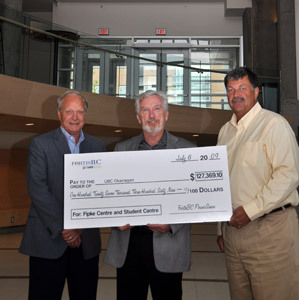 FortisBC presented a rebate cheque for more than $127,000 to UBC Okanagan this afternoon. The Fipke Centre for Innovative Research, which opened last fall, is the first new academic building to be completed as part of UBC Okanagan's $350-million campus construction initiative. With heating and cooling from groundwater, and other energy-saving features such as a wind tower for ventilation, the Fipke Centre is one of Canada's most sustainable university lab buildings. "Being a Canadian leader in campus sustainability is paying us back in many ways -- it reduces our emissions, which is rewarding from an environmental stewardship perspective, and results in real energy cost savings," says Doug Owram, Deputy Vice Chancellor at UBC Okanagan. "We're very pleased to be part of the FortisBC PowerSense Partners in Efficiency program. It's great to receive this kind of affirmation from our power provider that we're doing the right things." The FortisBC PowerSense Partners in Efficiency program encourages large customers to work with FortisBC to maximize long-term energy savings, says John Walker, President and CEO. "Through this program large customers such as UBC Okanagan are ensured they are operating at the highest levels of energy efficiency," says Walker. "We congratulate UBC Okanagan and UBC Properties Trust for their commitment to achieving significant efficiencies in the Fipke Centre for Innovative Research." The 6,500 sq. m. (68,000 sq. ft.) Fipke Centre was the first laboratory building in Canada to achieve a rating of five Green Globes from the Building Owners and Managers Association of Canada. That designation is reserved for designs serving as national or world leaders in energy and environmental performance. "The Fipke Centre is a great example of how we're incorporating energy efficiency and sustainable building design and construction practices into all our projects as we work toward completing the campus master plan," says Al Poettcker, President and CEO of UBC Properties Trust.